If you thought you had seen it all then here is a new take on what a phone could be like. Sharp Corp. in Japan has announced a robot phone and they have called it RoboHon. I thought at first that it might have been a joke, but no it really is a phone designed by well-known designer Tomotake Takahashi. The little fella is about 20cm high and has a 5cm screen on his back plus a camera and – believe or not – a projector in his forehead. RoboHon isn’t just a phone it walks, talks, dances and connects to LTE. It can identify people by their appearance or voice and can then act appropriately and let them know if they have received a message or for that matter when to smile for the camera. A friendly phone indeed. The RoboHon is scheduled to be released next year, but whether it will come to NZ, and when, is still to be decided, as is the price. Meanwhile here is a little video with English subtitles, I am sure you’ll find him quite adorable so maybe it is not such a silly idea. 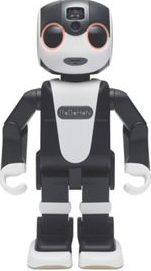 This entry was posted in Tech-Trends and tagged Phones, RoBoHon, Smartphone by Thor. Bookmark the permalink.